What sets the Parkland school shooting apart from other tragedies? Why has this event captured the attention of our nation in a way that is spurring action and change talk? This weekend my oldest daughter and I will be venturing to Washington, DC to participate in the “March for Our Lives” gathering in our nation’s capital. 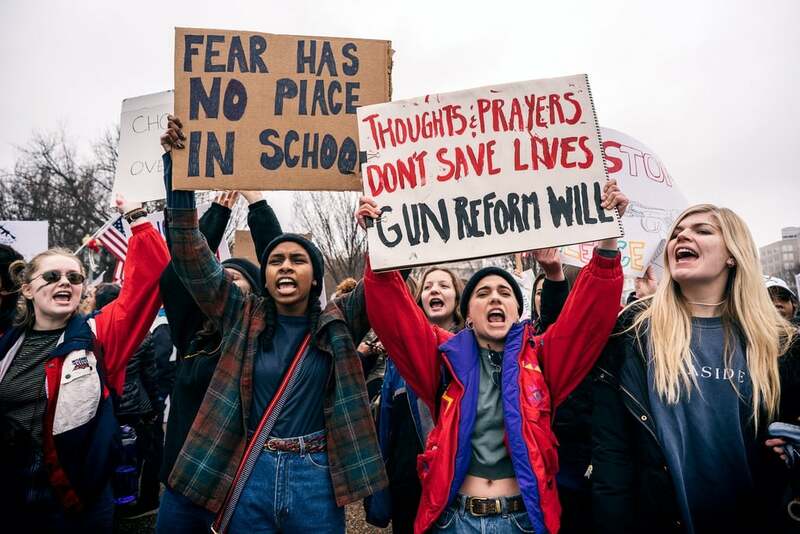 On March 24, students, teachers, parents and their allies will take to the streets of Washington DC and around the nation to demand that their lives and safety become a priority and that we end gun violence and mass shootings in our schools today. Local officials are preparing for 500,000 visitors from across the country to participate in the protest/movement organized by students of Marjory Stoneman Douglas High School in Parkland, Florida. The accused gunman (who we are choosing not to name) and a former student at the school, killed 17 people and injured others on Valentine’s Day. Authorities say the gunman was armed with an AR-15-style rifle he had legally purchased a year ago. Why has this recent tragedy struck a nerve in the American public so differently than past shootings? It was only last October 2017 when a gunman opened fire at a Las Vegas concert, leaving 58 dead and 851 injured. Why didn’t the mass casualties of that shooting spur greater awareness, anger, and change? Was it because it wasn’t a school shooting? Then why not Columbine or Newtown? I don’t remember either of those national tragedies generating such large-scale movements and protests. 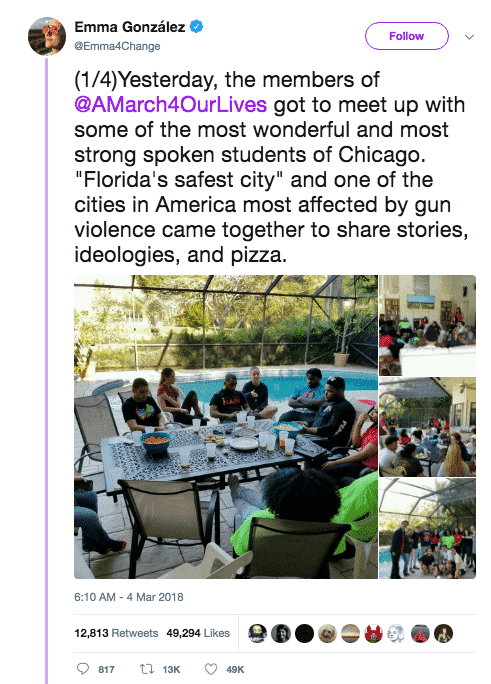 Think about it … the Parkland shooting survivors have kept the issue of gun control in the media a full month after the tragedy. Why hasn’t the public and media attention eroded? There does appear to be three distinct traits aiding the “March for Our Lives” protest and movement. Teenagers are leading the charge. Unlike the Columbine or Newtown school shootings, students from Marjory Stoneman Douglas High are leading the charge. It’s not the grieving parents or school officials. It’s not politicians or media pundits saturating the airwaves. 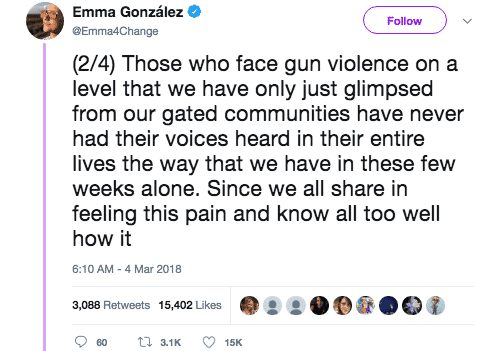 The survivors of the Parkland school shooting are providing a unique voice and needed energy to a movement that has significant support from around the nation. 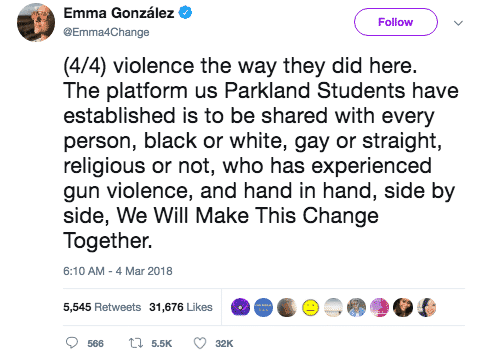 Students like senior Emma González are taking advantage of the media coverage to express their anger, their advocacy, and inspiring a nation to wake up out of their apathy toward gun violence and the growing extremism of the NRA. 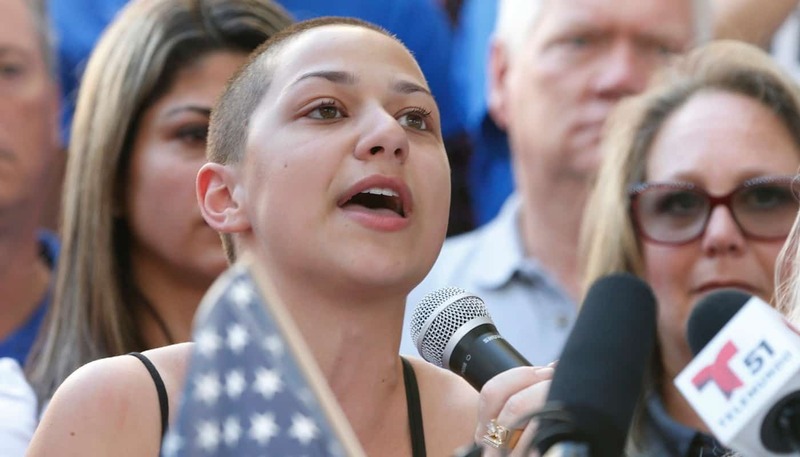 The students of Marjory Stoneman Douglas High School are self-confident, socially aware teens poised to change the gun-control debates across the nation. They have raised millions of dollars for organized events. They are giving speeches, doing interviews, writing op-eds, and going toe-to-toe on national TV with pro-gun politicians and activists. Technology is the tool of the masses. The Columbine High School shooting happened before the age of smartphones and social media. Students did not have Twitter, Instagram, or Facebook. The elementary children at Newtown didn’t have smartphones or Snapchat accounts. The rise of social media has given the American public an insider’s perspective into recent tragic events. When the shooting at Marjory Stoneman Douglas started on Valentine’s Day, many students used their smartphones to communicate to their families and document the chaos in real-time. One student posted a video from the floor of his classroom, allowing the world into that room to hear the gunshots, to hear the cries of those terrified students even as the gunman remained at large. The nation was given an inside view of the fear, chaos, and terror of an active, live school shooting. Americans were able to hear and see what transpired in Parkland. 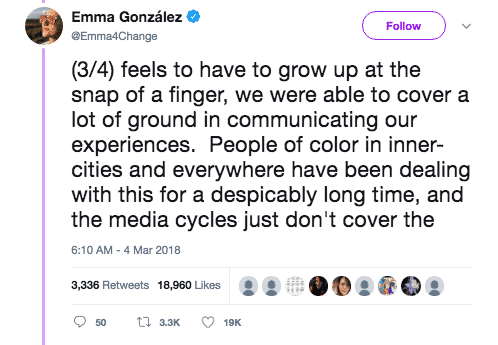 More than just documenting the school shooting, technology, and social media has proven to be the ultimate tool in organizing movements and protests around the nation. Hashtags like #NeverAgain and #MarchForYourLives spread like wildfires on social media and help expand its reach and audience. Technology and websites are helping local “March for Your Lives” events spring up around the nation. Our culture is embracing social and political protest. Our nation is in the throes of protest and social upheaval. All across our nation, people are demanding more from adults, men, people in positions of power, and our governmental leaders. This generation is not tolerating adults who sit on the sidelines of major social movements. Whether it be #MeToo, #TimesUp, or #BlackLivesMatter, America is in the midst of a watershed moment in its history. The status quo is no longer accepted. Apathy and cynicism will no longer be tolerated. Advocacy and change are being demanded of our adults, our lawmakers, and our leaders. Since Donald Trump shocked the world by winning the U.S. Presidential Election, America has been inundated with social protests, marches, and movements. The Women’s March last January emboldened feminists and emphatic folks to see themselves as part of a broader, intersectional and intergenerational movement. “Black Lives Matter” and the injustice of Ferguson, Missouri spread across the nation to expose how racially unjust America still is in the twenty-first century. The #MeToo and #TimesUp movements have demanded a national conversation about gender inequality and the pervasiveness of sexual assault toward women across the nation. #NeverAgain and the “March for Our Lives” is building off of momentum in our nation to right the wrongs that have plagued our nation for too long. And it is taking a small group of survivors from Parkland, Florida to wake the rest of the nation up to our silence, apathy, and/or complicity. Mass protests can help ordinary people regain and reclaim a sense of agency and empowerment. It can also reinforce to survivors that they are not alone. Social psychologists note that protests shift a person’s focus away from the individual to the collective grievances. The American public is angry, they’ve identified the injustice, and they’ve mobilized to usher in a new era. Thoughts are prayers are no longer adequate responses to tragedies. Change is coming. Be a part of the solution! Visit the March for Our Lives website here. Next article‘March for Our Lives’: Is Posttraumatic Growth at Play?